Let's cover some general issues with wide tires. 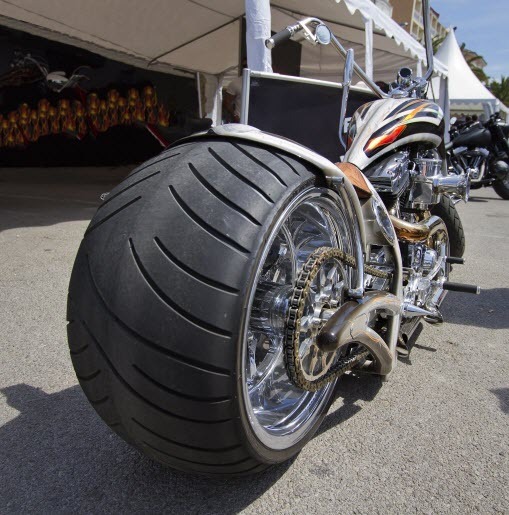 There is much "to-do" about wide tire motorcycles. It all comes down to appearance over practicality. Now this is not a slam by any means! A wide tired bike is an awesome looking bike, but if you take it on a cross-country ride, pull it on a trailer! If you are building your own frame, there are several things you need to look out for... weight being one of them. A fat tire bike weighs anywhere from 100 to 150 pounds heavier than a conventional bike. Hotter Engine or Follow Your Buddies? So either look into getting a hotter engine or get used to following your buddies, especially in hill country! Another issue regarding a wide tire bike is the choice of belt or chain drive system. The rear wishbones already need to be wide to fit that fat tire but make sure you have enough room for the entire rear assembly. The standard wide drive belt will take up more room than you may think. Finally, you must consider the width of the rear tire sidewall when it is inflated. Additionally, you must consider the inflated sidewall when you buy a replacement tire. The same size tire is not always available from the vendor you purchased your original tire from. Considering something a little more standard may save you many headaches in the future. How To Correct The Problem With Wide Tire Motorcycles. On this issue, there isn't exactly a problem to be corrected. That is, unless you introduce a problem during design or assembly. Something like this REALLY needs to be thought through before your project. This issue is dictated by personal taste, but you may be faced with one annoying inconvenience with a wide tire bike. Depending upon the girth of your human anatomy, you may have to ride a little side-saddled in order to remain upright! But once you get used to it, you should be okay. This information is intended to be used by trained and skilled professionals familiar with welding and proper motorcycle construction. The reader of this publication assumes responsibility for the use of these materials and information. The publisher and author and marketing agents assumes no responsibility or liability whatsoever on the behalf of any purchaser or reader of these materials.